I love it when Lucas is given a book as a gift; a story is a timeless present for a child. 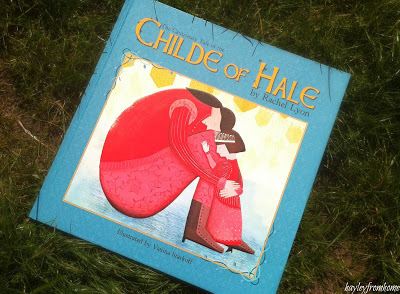 The Childe of Hale is an old Liverpool legend and has been transformed into a beautiful children’s book; it is rumoured that the Child of Hale was a real life giant by the name of John Middleton and there is even a cottage in Hale where he is supposed to have lived. Rachel Lyon is a local author, living in the North West of England and I had heard that her book was being published. My Nana very kindly bought a copy for Lucas as his Easter gift and I have enjoyed it so much I wanted to share it with you. 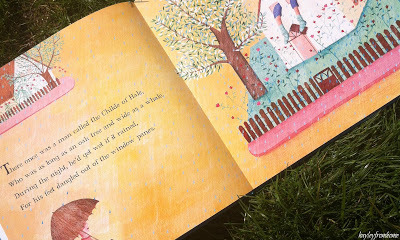 This lovely book tells the story of the Child of Hale accompanied by some beautiful illustrations. I love this interpretation as it is most definitely, ‘A Cautionary Tale’ and has a good moral message; as all good fables should. The Childe is whisked away from his home by the king for his queen and lives in splendour, but it is too good to be true and he realises what truly matters to him. As an adult I find it a nice read; it has a good rhythm and the words easily trip off the tongue. If you read regularly to children you will know that some books are lovely to read out loud whereas others don’t seem to flow. I like to read books that rhyme nicely as it is pleasant to read to Lucas and I put more expression into my voice. Although the book is a little old for Lucas’ age we still enjoy it as the pictures are bright and engaging and I can point to things he will recognise. He particularly likes to point out the animals to me! This is an all round great children’s story and a beautiful book but the thing I love the most about it is that it is a local legend, lovingly brought to life. This book was bought for Lucas as a gift and I wanted to write about it as we enjoyed it so much.